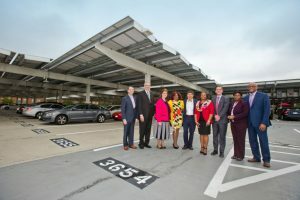 On October 11, representatives from the University of Maryland, private businesses and the Maryland State government gathered to celebrate the construction of more than 7,000 solar panels on top of campus parking garages. The solar canopies were installed over Regents Drive, Terrapin Trail and Mowatt Lane parking garages. 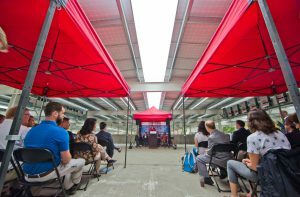 These new solar structures will generate an estimated 2 megawatts of clean, renewable energy, roughly 2% of the campus energy needs. 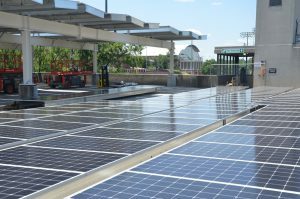 The project here at the University of Maryland, is one of the largest solar canopy projects in the state. 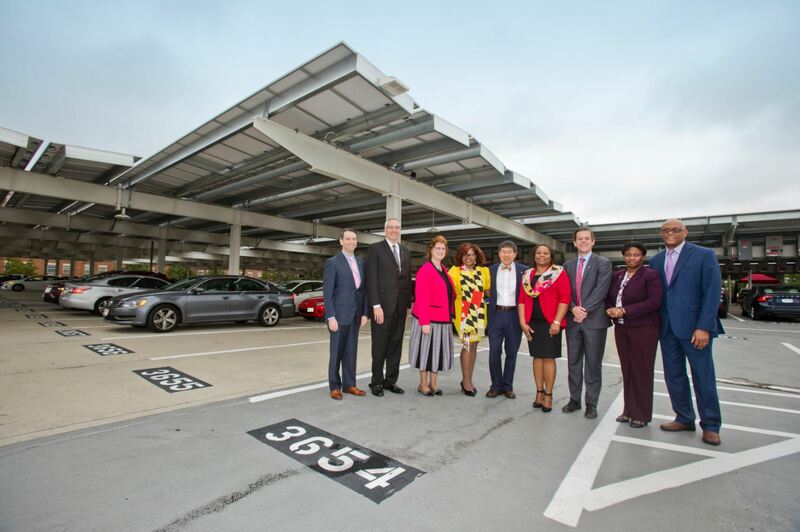 MEA recently launched our FY18 Parking Lot Solar Photovoltaic Canopy with EV Chargers Grant, which offers $1.5 Million dollars in funding. Full details on this grant can be found here. The project was a joint effort between multiple departments at the university, as well as the Maryland Energy Administration and WGL Energy. 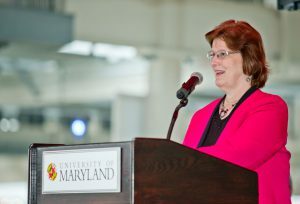 The Maryland Energy Administration provided a grant of $250,000 for the project and UMD’s facilities management matched the funds. MEA Program Manager Chris Russell inspecting the relay boxes for the solar panels. These solar canopies have expanded clean energy on campus and are just one of the many projects that the UMD Office of Sustainability helps to support. The UMD Office of Sustainability began in 2007, and helps to educate and involve the entire campus from the students to faculty and staff on matters of sustainability. Additionally, the office maintains the University Sustainability Council that exists to advise the campus, as a whole, on sustainability and the Climate Action Plan. UMD recently announced its Climate Action Plan 2.0, and has been active in efforts to decrease the campus carbon footprint. UMD us looking to incentivize green transportation, expand composting efforts and implement new land use and maintenance regulations. UMD is making headlines for their commitment to sustainability, and plans to be carbon neutral by 2050. 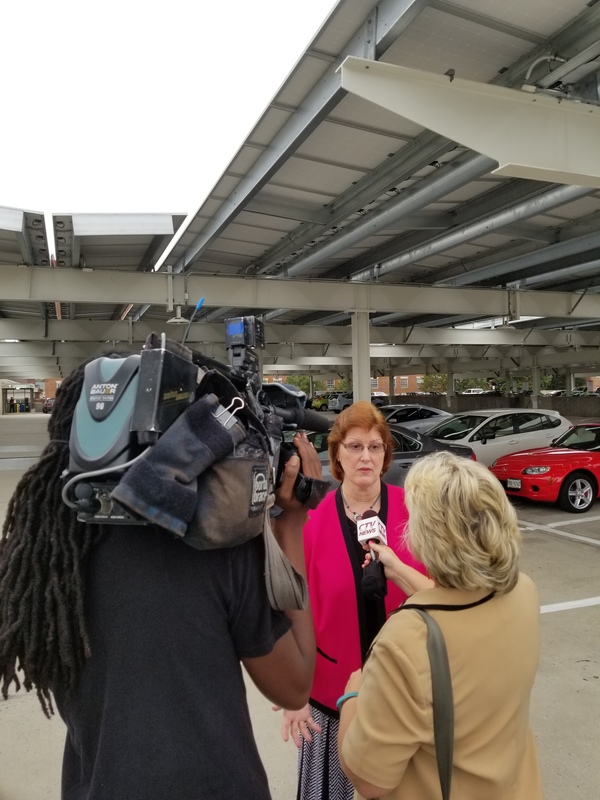 Maryann Ibeziako, the Director for Engineering & Energy in facilities management, stated that the new solar canopies are a key part of campus sustainability efforts that involve renewable energy. 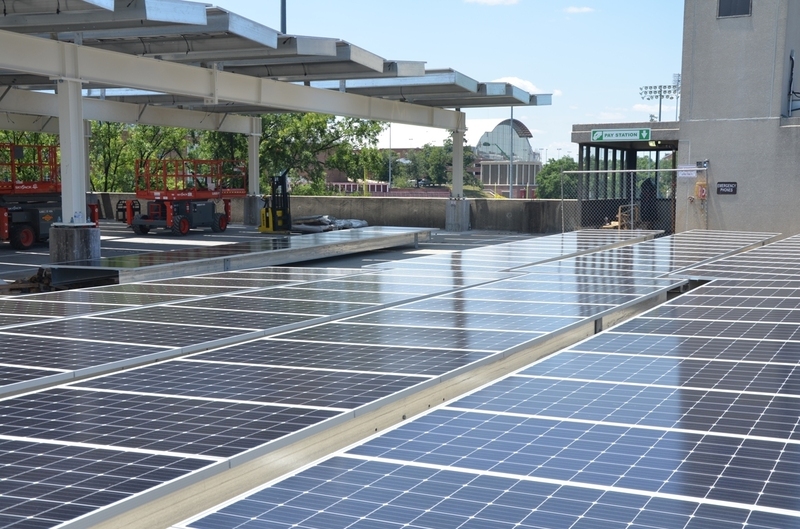 UMD’s previous on-campus renewable energy goal was to generate 2.7 megawatts of solar power for university facilities by 2018. 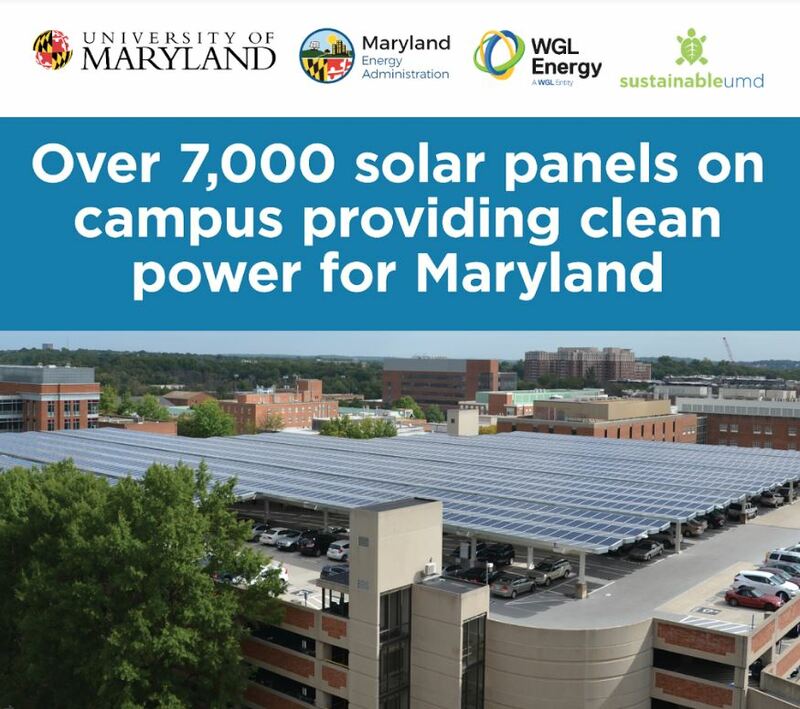 The three solar canopies help UMD exceed that goal and are expected to generate 2.946 megawatts. 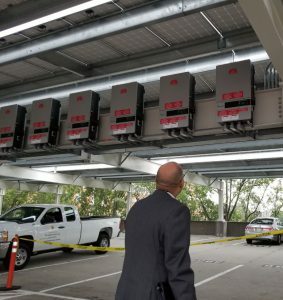 “The actual total cost if we had to install it ourselves would have been about $8 million, so instead of doing that, we don’t own the equipment,” Ibeziako said. “The installer owns the equipment. We are just buying energy.” To read more on the construction of the solar canopies, click here. 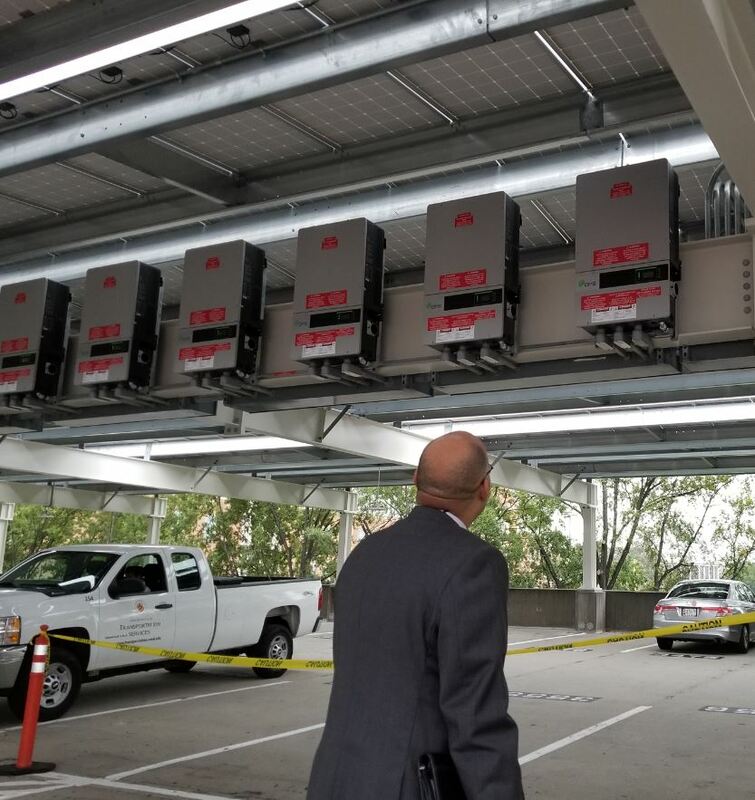 The parking garages with solar canopies are also host to electric vehicle (EV) charging stations. The campus currently has about 30 EV charging stations on campus, all of which are in high demand. 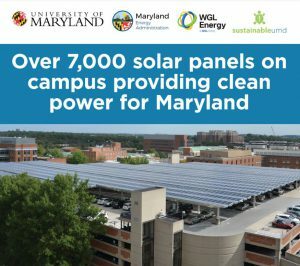 MEA is proud to have played a small part in this project, but the real recognition goes to President Loh, UMD, and their Office of Sustainability. 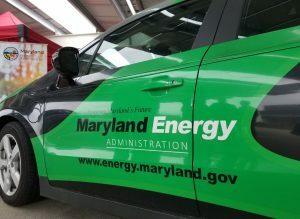 To keep up-to-date on UMD news, click here and stay tuned here to see what comes next for energy efficiency in Maryland.